It is recommended that you feed your bird a variety of vegetables for optimal health. I keep a gallon-size plastic zip bag in my freezer for this purpose. I add to it as I have bits and pieces of different items that I don't have enough to do anything with. For the very first bag-full, I started off with "birdy-bread", frozen carrots, peas, green beans, Lima beans, corn, celery, bell pepper, broccoli; anything that I could think of that was healthy. Some of these vegetables can be raw, others can be cooked. Just use whatever you have on hand. If we had a couple slices of potato or broccoli left over from supper, the food was diced, frozen in a thin layer, broken up into individual pieces, and added to the bag. We broke food up into individual pieces so as to evenly distribute throughout the bag. The bag of food will never be the same, depending on what you have added to it, but with a fair amount of variety, for optimal health. When you make your own, try to go easy on any fruit added. A little fruit is OK, but fruit has natural sugar and birds are highly prone to yeast infections from too much sugar. Small pieces of meat are also OK, birds need protein too. Grains can be added as well; oatmeal, rice, barley, etc. Be sure to freeze everything individually so that it can be distributed evenly through the bag. That way every time you feed your feathered friends, they get a small portion of all the nutrients available in their food rather than a clump of rice or potatoes one day and a clump of carrots the next. A good basic recipe for "birdy bread" is to use a corn muffin mix as a base, (organic is best) or your own cornbread mix. Prepare mix as directed, add egg (or more than one for added protein, shell and all), fruits, veggies, nuts, pelleted bird food, whatever you know that your bird likes to eat. Bake according to directions on the box; except double the baking time. The added water in the fruits and vegetables will add to the baking time. Once cooled, crumble into chunks, and freeze. Add chunks to your birdy bag in the freezer and simply pour out what you will need to use, each time you need it. Caution: Whenever you use chicken eggs make sure that they're cooked very well. Chicken eggs can potentially carry diseases that can pass to your bird. Scrambled eggs should be very dry and boiled eggs should be cooked for over half an hour. Source: The idea for the bag of mixed bird food is mine; the caution about thoroughly cooking chicken eggs is from the book, Parrots For Dummies. 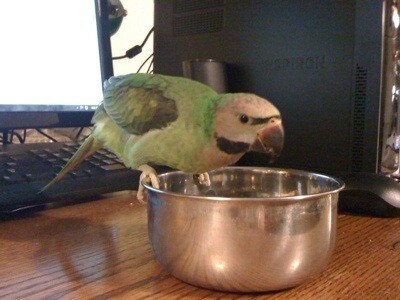 The parrot pictured is 'dita, (Bandita), a Masked Indian Ringneck.